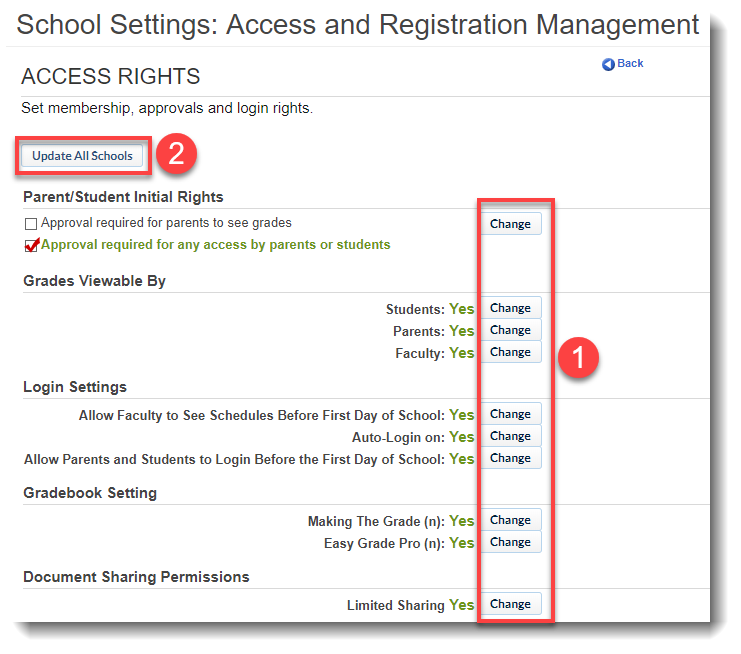 For your convenience, District Admins may use School Loop Plus to configure the Terms Settings, Marking Periods, and Access and Registration Management Settings for all schools, from a single form. Since these settings will be pushed to all schools, it may be necessary to adjust the settings for those individual schools who use different terms, term dates, or require unique school settings. Terms must be set each school year after the first import of data and before the start of the school year. 1. 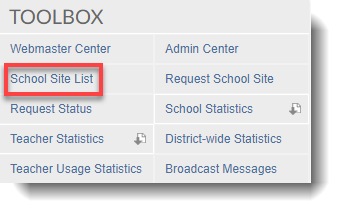 Access Global Settings by clicking on the School Site List link in the Toolbox located in the right column of your District Admin portal homepage. 2. Click on Edit Terms, Edit Marking Periods, or Edit School Settings, depending on the task you wish to accomplish. 1. If you've not used this feature before, you must first add the term labels (e.g., s1, y, fall, etc.) by clicking the Add Term button. NOTE: When adding terms, you must use the exact term label (lower case) as imported from your SIS. If you are not certain of the labels, check with your district Sloopy installer or contact School Loop for help. 2. To add terms, enter the correct label, set the start date for that term and select the subsequent term (e.g., s2 would be the subsequent term for s1). Always use lower case when entering term labels. Hint: Enter the labels in reverse chronological order. For example, if the terms are m1, m2, m3, and m4, start with m4 and work your way back to m1. This will put the labels in the correct order as labels automatically come on top of the list when submitted. 3. Choose End of School Year for terms that do not have a subsequent term. 4. Once you have added all terms, click on Update All Schools for the changes to take effect. Note: Some schools may have various separate term labels and/or dates. In those cases, go to the school site's term settings to edit the terms. The image below illustrates terms that have been correctly set. 1. Click New Marking Period to create marking periods for all of your schools. For complete instructions on creating marking periods, see the Grade Export Setup Help page. Typically, this global tool should only be used at the beginning of the year before schools have set up any marking periods. If marking periods already exist at school sites, be sure to use the same unique codes and dates. 2. Click the Update All Schools button to update all schools with the marking periods you have created. Important Note: Updating the marking periods will delete and overwrite the existing marking periods at every school in this district. 1. Choose the desired settings using the Change buttons on this page and then click the blue Update All School button. These settings will take effect on all the schools listed in your school district. Depending on the number of schools in your districts, it will take a few minutes to update all schools. If necessary, you can modify the settings for individual schools, by accessing these settings for that site. Details about each of these settings are covered in the page for School Settings and Gradebook Sharing.